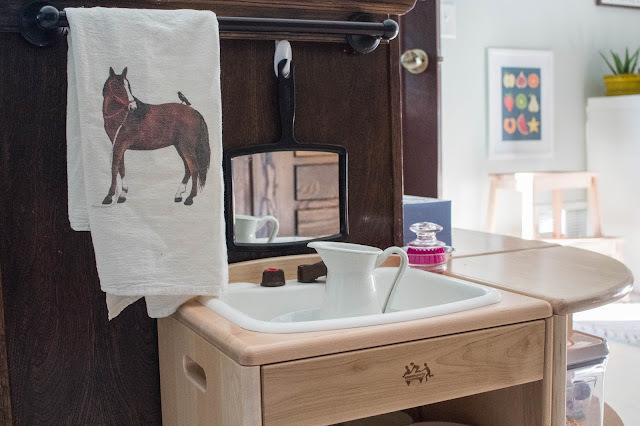 If you have been following me on Instagram, then you know that my kids have their own small kitchen work space in our kitchen. I've frequently shown Henry and Nora working in their kitchen, and have long promised a post featuring it's details. Well, here it is! 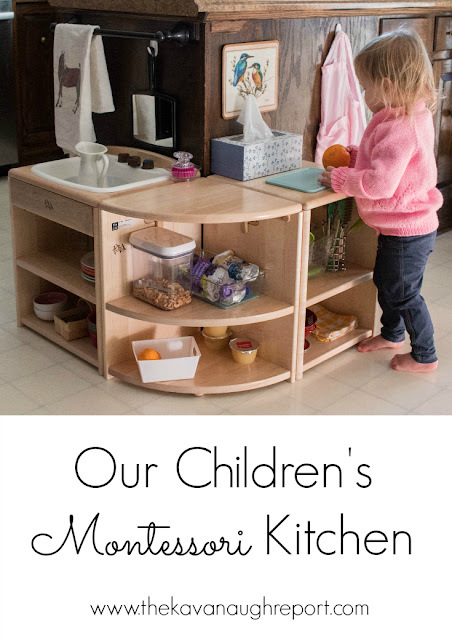 Our Montessori kitchen is used for nearly everything the kids do in the kitchen. 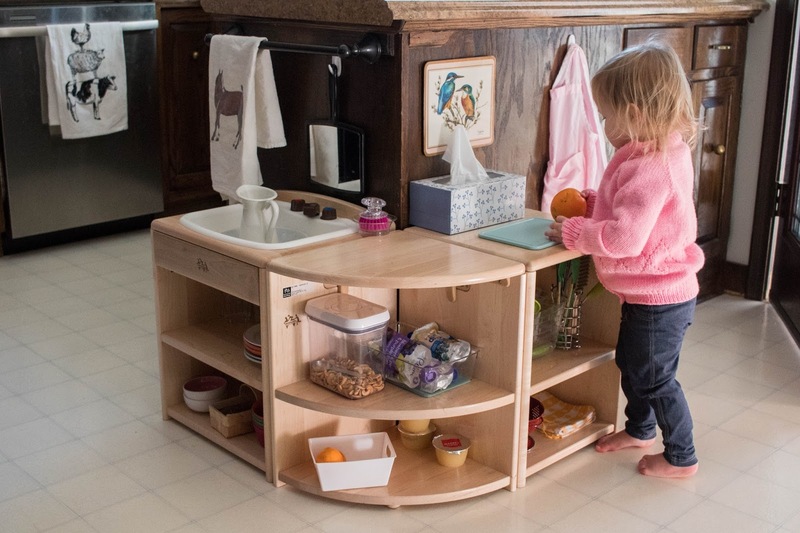 The unit itself is part of the toddler play kitchen series created by Community Playthings. It's three separate pieces that are designed to fit together in a variety of configurations. 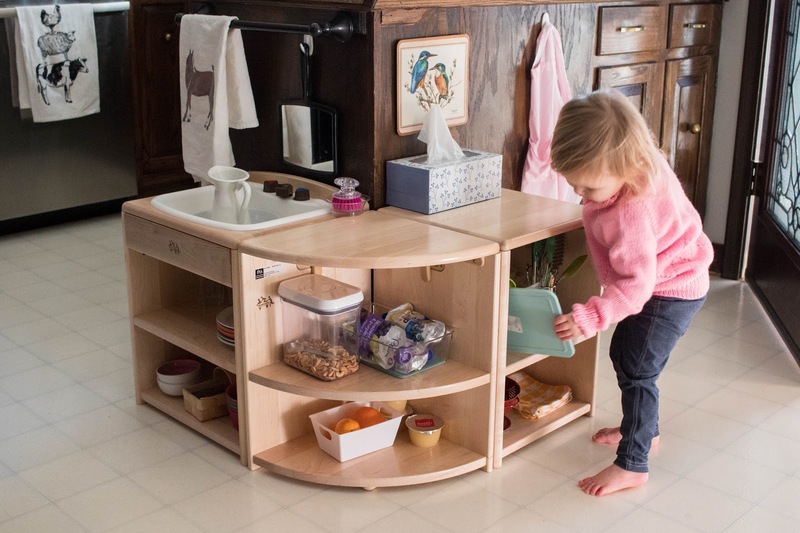 We chose to have the unit wrap around our main kitchen counter so the kids were right in the action. The kitchen itself is divided into a few areas. First, there is the counter space. 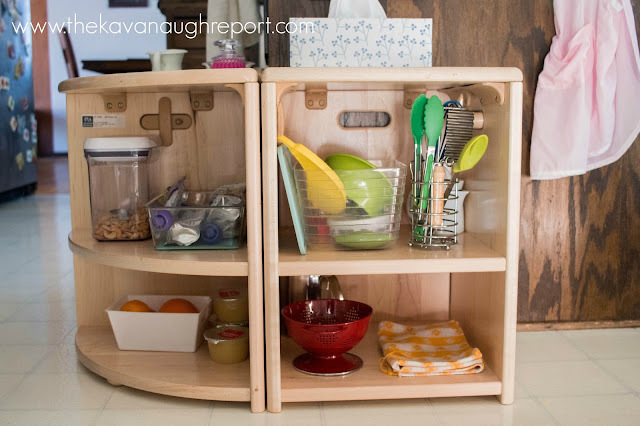 This is where Nora and Henry do all their food prep, and other kitchen work. I love that they have enough space to spread out, while keeping their feet firm and flat on the ground. Under the counter space are two areas. One is the children's tools. These are all the things they use to cook/bake/whatever in the kitchen. These are all child sized and meant exclusively for them. Next is our self-serve snack area. 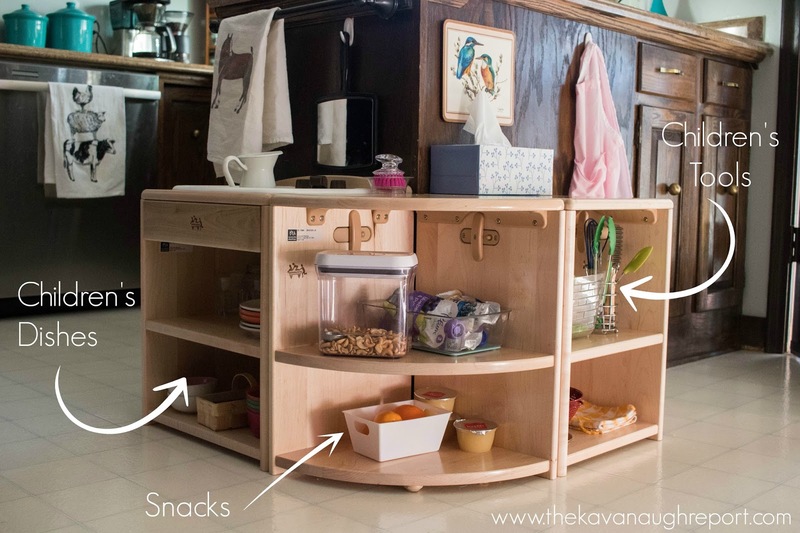 This area keeps a variety of snacks that are available to the kids when they need them. The exact snacks available vary week-to-week. But, the idea is for them to have independent access to some food. This week they have some nuts, some fruit/veggie pouches, fresh oranges, and applesauce. Then, there is the children's dishes area. 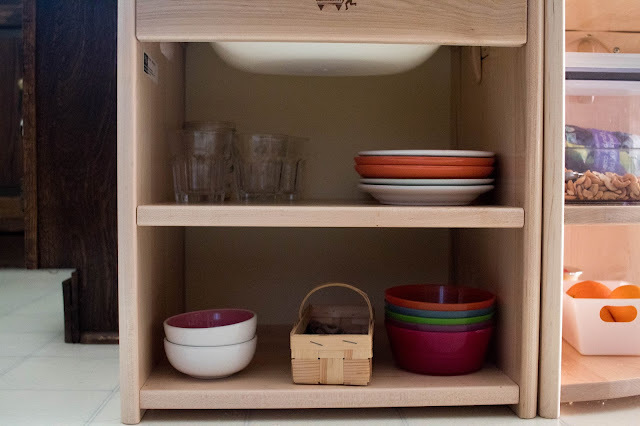 This area holds all of the cups, plates and bowls that the kids regularly use to eat their meals and snacks. The small basket holds their forks, spoons, and knives. This way they can get whatever they need to make a meal or snack all in one place. Finally, there is the sink! 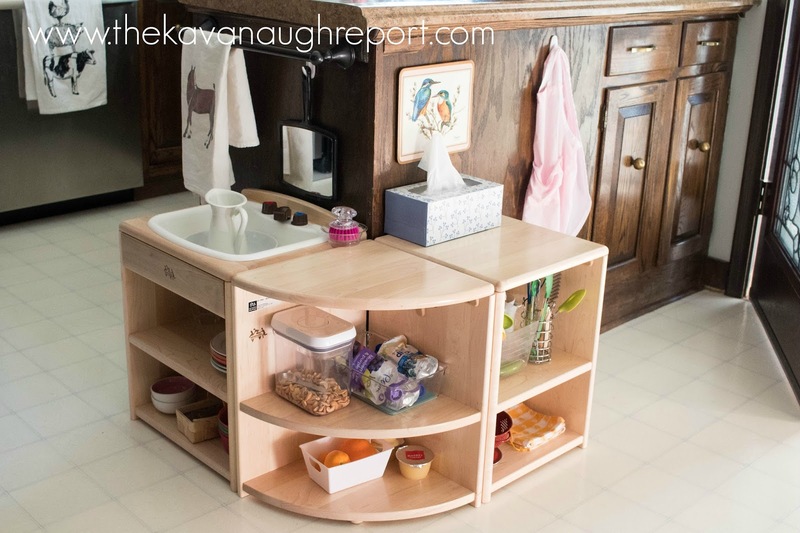 Since this is a play kitchen, there is no running water in the sink. Instead, we use a separate water source with a bowl and pitcher. The water source is just off the kitchen in our art area just next to the kitchen. 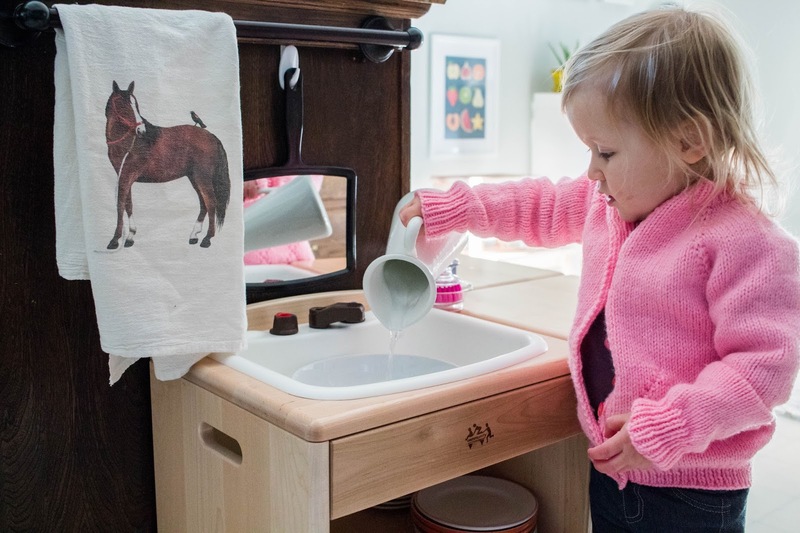 The kids can fill the pitcher then pour into the bowl in the kitchen. Then, when they are done with the water, we can dump it into the regular sink. We don't use this water for drinking; they have another dispenser in our fridge for that. The mirror allows them to watch their work and gives them a place to check on themselves. 1. Make it child sized! Stock it with appropriately sized materials. 2. Allow for independence, keep things low. 3. Safety first! Make sure your kids are ready for the tools that are available. If you are thinking about a Montessori kitchen, go for it! Do you have a Montessori inspired kitchen space? 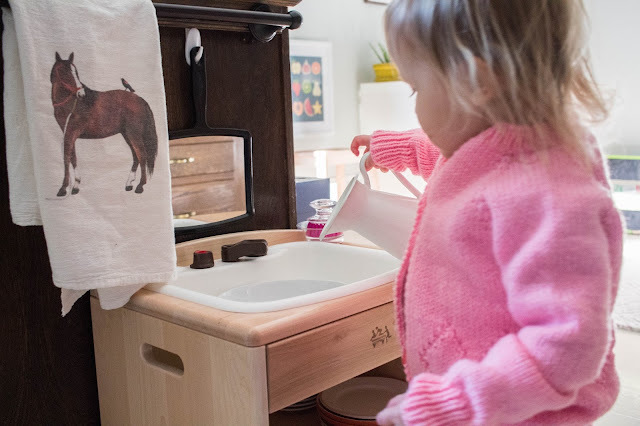 Do your kids love to work in the kitchen? I love it! Have you ever heard of the Little Tikes Splish Splash sink? It has a hand pump for real running water. I got this for my 2.5 year old for Christmas and it works perfect! At what age do you think they are ready for a kitchen set up like this? What will you do when Gus is mobile enough and is interested in just pulling things off the shelves? We are at that stage here in our home and are at a bit of a loss. Keeping her from the kitchen area entirely is not always possible.